With Courtney and Taylor coming off back-to-back-to-back victories, the RCMP officers seem poised to take The Amazing Race Canada title this season. They don’t bicker and they seem to have fun, two key ingredients to success. 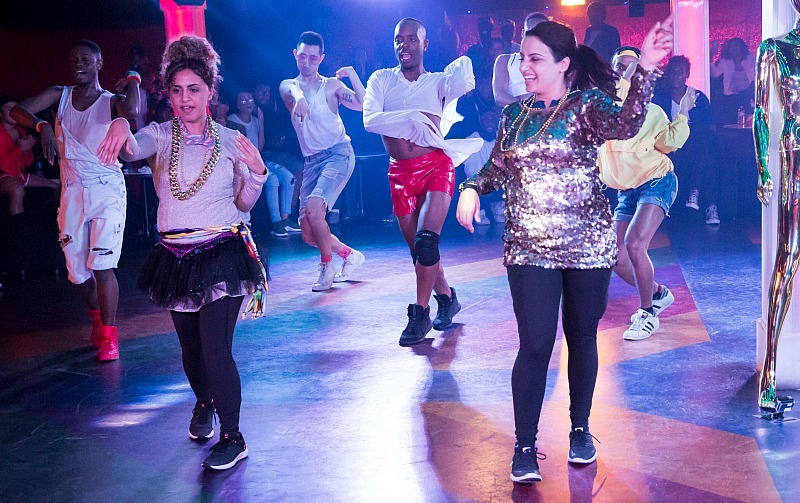 But then, fellow siblings Martina and Phil have been crushing it of late; could they be the season’s dark horse team? With the number of teams dwindling, everyone jetted to one of my favourite spots in this country: Prince Edward Island, home to Cows ice cream, lobster suppers, Anne of Green Gables and potatoes. Lots and lots of potatoes. But before that, the teams had to get there. Courtney and Taylor and Martina and Phil helpfully reminded viewers of the alliance they formed back in Leg 1. Of course, that was foreshadowing. At some point, that alliance would be tested, put into play or broken. Beaconsfield Historic House was the first location, in downtown Charlottetown, and Kwame and Dylan were the first to arrive. Teams were asked to participate in a scavenger hunt to locate statues of Eckhart the mouse, the hero of a local children’s book. There were nine bronze statues, but only three held Race clues to the next destination. Rather than running all over downtown searching, Mar and Leanne took the time to read up on Eckhart. The result? They collected the first clue before anyone else. Sadly, the fact Courtney and Adam were on a small island didn’t stop them from making a wrong turn. Those two are cursed. Meanwhile, Mel and Nancy faced their Speed Bump after arriving at Beaconsfield Historic House. There they were instructed to cut hair for charity at The Humble Barber, donating locks. This test was an emotional one for Nancy, who was diagnosed with cancer when she was 45. Needless to say, it was a touching and tearful few minutes showcasing the power of The Amazing Race Canada. It wasn’t revealed how long the Speed Bump lasted, but by the time Mel and Nancy had completed it, they and Courtney and Adam were both asking for maps revealing the locations of Eckhart. Martina and Phil and Courtney and Taylor used their alliance to help the latter team score their final Eckhart location. When we last left Kwame and Dylan, they were wandering aimlessly. Mar and Leanne found the three pint-sized clues first, followed by Courtney and Adam who used the help of strangers to leave Charlottetown. The aid paid off big-time and they leapfrogged to first place upon arrival at the Road Block. Supper was the order of the day at The Table Culinary Studio but scrambled menus threatened to confuse more than one Racer. Courtney kicked things off on the right foot, followed by Nancy, Mar, Phil and Taylor. Courtney was simply glowing as she received the clue card and ran out to meet Adam. It was good to see them celebrating. Taylor took the time to help Phil decipher his mixed-up menu, repaying them for aid in Charlottetown. The Detour was, as expected, tuber themed. Teams could either choose to milk goats to make soap and label different types of soap or till the soil and plant potatoes. Every team chose to plant potatoes—I would have too—and Dylan and Kwame were once again left in last place, this time at the restaurant. For the very first time—on-air at least—we saw Mel and Nancy argue. “Just tell me what to do,” Mel said. “Because that’s what you like to do.” It was a brief altercation, but was it an indication of what each Leg of the Race has been like so far? (Mel’s eye roll said it all.) Still, she brightened up when they completed the task ahead of Courtney and Adam and drove off to Cavendish for a little zombie paintball. Every hit taken by a team while hunting for their next clue was a minute time out. Mel and Nancy, Courtney and Adam and Courtney and Taylor were the first three pairs to leave for paintball while Mar’s back gave her fits and Dylan and Kwame finally arrived. The drive to Cavendish gave Nancy and Mel the chance to air out their grievances in an honest way. It was uncomfortable to watch, but credit to the producers for really showing the pressure these teams are under. Mel and Nancy apologized to each other … and then got hit 15 times for a 15-minute penalty. Courtney and Adam were assessed a 16-minute penalty and had a minute to sit and watch Mel and Nancy exit for the Pit Stop. Courtney and Taylor were hit 23 times while Martina and Phil were hit 19. Leanne battled her fear of enclosed spaces for as long as she could but she had to bow out, giving Dylan and Kwame an open door as they were given a two-hour penalty. Dylan and Kwame were only hit 14 times, closing the gap between them and the cheerleaders. This Leg’s Pit Stop was located on a lovely Cavendish beach where Nancy and Mel checked in and received a trip for two to Istanbul. It was pretty cool to see last week’s saved team land in the top spot. Clearly, PEI was just the salve some teams needed, as Courtney and Adam were second on the mat. Dylan and Kwame found their way to the Pit Stop in plenty of time. It was a muted celebration for them as they claimed the final spot on the Leg and Leanne and Mar were eliminated from the Race. Were you sad to see the cheerleaders leave? Who do you think will win? Let me know in the comments below. Let’s be honest. Zainab and Monica’s luck was going to run out eventually on The Amazing Race Canada. It happened last week, leaving six of the strongest teams left to battle for top position as the midway point to the season was reached. With two flights of three departing for Winnipeg, that meant split-ups and, perhaps, a little more drama when it came to airplanes. Taylor and Courtney looked very strong headed into this Leg of the Race and are definitely the team to beat. But with the season’s first head-to-head competition, would the RCMP officers prevail? They, along with Mel and Nancy and Leanne and Mar were all on the treasured first flight while Martina and Phil, Dylan and Kwame and Courtney and Adam had to settle for departure No. 2. There was no indication of how much of an advantage Flight No. 1 had over No. 2 other than the second trio saw the first depart, destined for Winnipeg and the Canadian Museum of Human Rights. Leanne and Mar got there before the other squads but the task was a great equalizer. Teams had to pair quotes with the images of the human rights activists who uttered them; with 11 galleries to scour, this was going to be tough. With viewers having no idea how long the task took, it was the cheerleaders who emerged first. The back half trios arrived at the museum while Nancy and Mel were still there, so there wasn’t too much lag time between flights out of Toronto. Martina and Phil’s plan of dividing and conquering paid off and they jumped to third place. Nancy and Mel and Courtney and Adam teamed up to finish their boards. Leanne and Mar, predictably by this point, nailed the ballet in their first attempt and departed for the Face Off to throw darts at the Royal Canadian Legion. Once there, the first team to hit all segments of the board would be their ticket to advance. Leanne and Mar faced off against Courtney and Taylor. It was the siblings who won, leaving Leanne and Mar to take on Nancy and Mel. Leanne and Mar were triumphant, leaving Nancy and Mel to throw down against Martina and Phil. Martina and Phil won, leaving Nancy and Mel to face Dylan and Kwame. Kwame, who had never thrown a dart in his life, made it look easy and they moved on, leaving Nancy and Mel vs. Adam and Courtney. Not even Mel’s two bullseyes could stop Adam and Courtney, who left the rodeo star and Olympian in last place to wait out a time penalty. Now in first place, Courtney and Taylor drove to The Forks Market and the Road Block. Here, Racers had to complete the cup and ball trick and create a balloon animal. Courtney, Leanne and Martina all took the test head-on (Martina’s facial expressions killed me), with Courtney finishing it quickly. Honestly, she was really good at both tasks and had the enthusiasm needed to deliver a quality magic trick. Dylan looked amazing decked out in his magician’s outfit but struggled to complete the task. 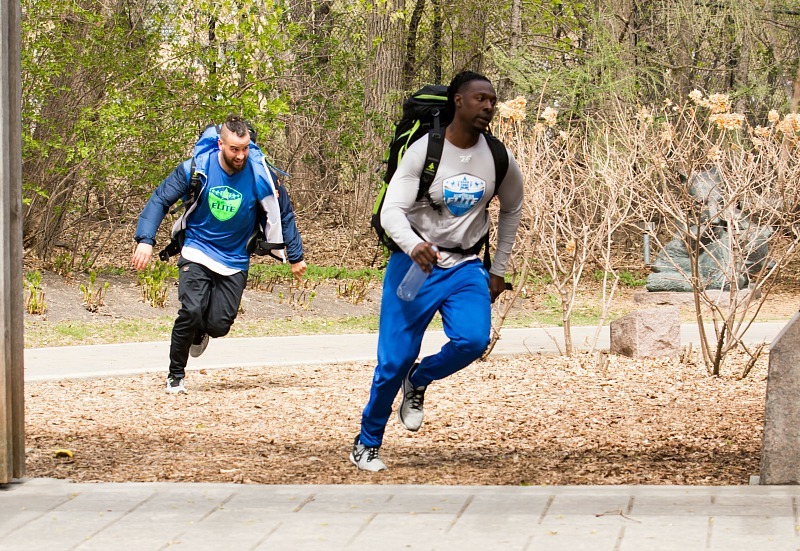 The Leg’s Pit Stop was located in the Leo Mol garden in the heart of Assiniboine Park where Jon welcomed Courtney and Taylor in first place for the third straight time. Martina and Phil, who have proved to be a lot better in reality than perhaps they were on paper, arrived in second place. Adam and Courtney seemed destined for a decent finish until they got lost on the way to the park. Still, it made no difference and they arrived on the mat ahead of Nancy and Mel. In a turn of events that I should have seen coming, Jon revealed this was a non-elimination Leg and Nancy and Mel were still in the mix. They’ll have to complete an additional task next week in Prince Edward Island. Do you think this should have been a non-elimination Leg? Can Martina and Phil win it all? Let me know in the comments below. Last week in Stratford, Ont., Zainab and Monica were once again saved from elimination when it was revealed the Leg wasn’t over and that teams were headed to Toronto. That also meant that I—along with fellow journalists and social media influencers—would continue our travels as well. Shortly after Taylor and Courtney landed on the mat in first place, we headed for the production vehicle and hit the highway for Canada’s largest city. Humidity and rain showers threatened as they, and we departed. 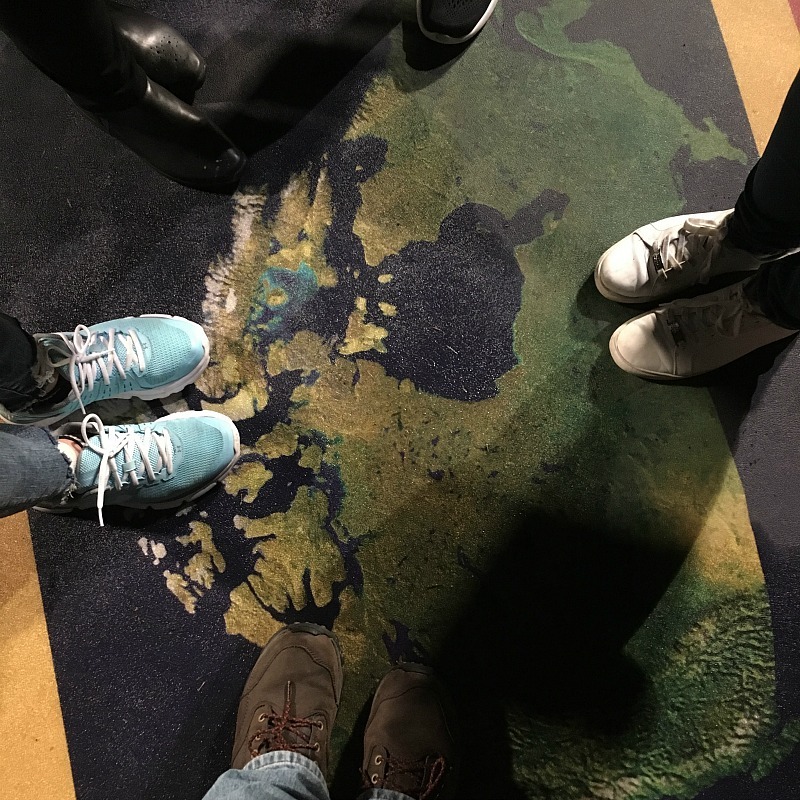 Teams were tasked with, once they’d arrived in Toronto, visiting the observation deck at city hall to locate a flag marking the location of the next clue. (Behind the curtain: we skipped the observation deck, a personal bummer, and set up shop in Yonge-Dundas Square to see who would arrive first. We heard several teams were slowed down by weather and traffic.) Taylor and Courtney saw the flag right away, Adam and Courtney ended up at Queen’s Quay, and Phil and Martina arrived at city hall and quickly spotted the flag. The next stop? One of the most unique bookstores in the world. 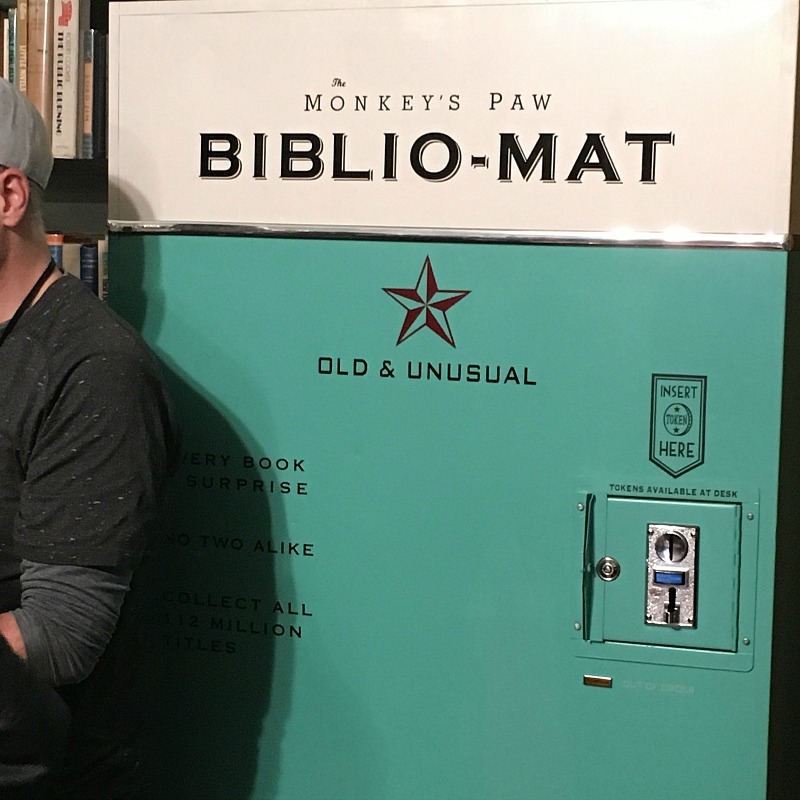 The Monkey’s Paw bookstore features the Biblio-Mat, a machine that vends odd books. I’ve used it and was given a book on the history of hanging in England. Anyway, the Racers had to use public transit to get there while our production vehicle drove us over. The Monkey’s Paw was also the location of a Double U-Turn. Back at Yonge-Dundas Square, Martina and Phil completed the task, followed by Nancy and Mel, an impressive Dylan and Kwame (the super-fan gave them directions), Adam and Courtney and Leanne and Mar. Zainab and Monica ran right past the square and into the building next door, delaying their arrival. Martina and Phil opted for Latte Art. (Behind the curtain: we were in The Monkey’s Paw when Phil and Martina arrived. I was secretly hoping to make it on TV—we were asked to act like customers—but were left on the cutting-room floor.) Nancy and Mel, meanwhile, were again shadowed by Kwame and Dylan as they sprinted to the bookstore and then to the club. Courtney and Adam, worried about their own safety, U-Turned Monica and Zainab. Taylor and Courtney nailed the routine in their first try (the energy in the club was electric when they finished) and departed first, followed by Leanne and Mar. (We left after the cheerleaders too, for our final destination.) Mel and Nancy vogued to success next, followed by Dylan and Kwame and Kwame’s Hammer pants. That left Adam and Courtney and Zainab and Monica fighting to complete the routine first. Of course, Monica and Zainab still had to make the lattes. The North York Harvest Food Bank was the next stop for the Racers, where they teamed with Dempster’s to prep and pack boxes of baked goods for shipment across the region to families in need. Taylor and Courtney kept their heads, stayed organized and filled the boxes before anyone else had arrived. They departed for Ireland Park, steps from the ferry to Billy Bishop Airport, and the Pit Stop. Mar and Leanne misread the clipboard and began collecting boxes of baked goods instead of bags. It wasn’t until they asked Mel and Nancy what they were doing that the cheerleaders realized their mistake and got back on track. That lost them a higher ranking to Mel and Nancy, who completed the Leg in second place. As expected, Zainab and Monica’s luck ran out during this Leg and they couldn’t come back from being U-Turned by Adam and Courtney. They were eliminated from the Race. Once again, a big thank you to Bell Media, Insight Productions and CTV’s public relations team for inviting me along on this fun and very full day. It was a thrill to watch filming and get the opportunity to stand on the mat at the end of the Leg. Who do you think can win it all this season? Let me know in the comments below! Club images courtesy of Bell Media.